Learn how to scan a document into the Macintosh software, follow the steps below and if you have any questions write a comment. The MAC teams as it is also called, are all computers are manufactured by Apple, the scan a document is simple with this operating system can even be done in several ways, then will show some methods such as scan an image or document. We have a scanner or multifunction printer with scanner up and running perfectly, our team installed without any error. This is the first method and simple it can get a picture of what we put on the glass printer or scanner, so we must go to printers located in System Preferences. 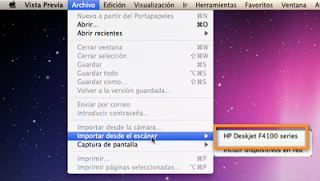 An image of printer that says print and scan, you must click and a pop with the device we have to appear estanear appears. On top of this window open two options, one that says printers and the other that says scanner, select scanner, once the scanner tab, click on open scanner, a window and scanning the document appears. Appears on the right side of a menu where we can apply the scan settings such as color, type of document, where you can save between other document. This is a faster and less specific option to scan a document, you can obtain a scanned document but with fewer options to apply to the file. First thing we do is go to applications select the preview option. Opens a new window that corresponds to the preview, as this window is open go to the top left of the screen and click on File, then Import from scanner. We select the equipment we have installed, remember that the document should be in the crystal printer or scanner, we click the computer immediately begin the process of digitizing what is on the scanner glass. Since the scanned document appears in the preview we document that we get, as in the first step can select the type of document we want, qualities etc. Then the method for scanning by capturing images. This is the last method but not the worst, we can use it like the above methods to scan a document you need to send, edit or save on your computer. Again we will seek applications capture option already in this window will detect in the top left device operable to capture an image, if we have a scanner appears, if you have a printer with scanner will appear in the same place you choose the one you want if you have more of one. Like the first method in bottom right are two types of scans, normal scan and custom appear in this you can select to receive document type, size, scale and others. With this operating system have several options for scanning without the need to download a driver or scanner application just in case any need or problem just ask a question, we will gladly help you.